If you’re a chevron lover but hate dealing with color changing while crocheting, here’s the perfect scarf for you! This unisex chevron pattern is cleverly designed so that you can see the ridges and zigzags using only a solid colored yarn. Of course you are welcomed to change colors if you wish or use a variegated yarn, but it is not required. 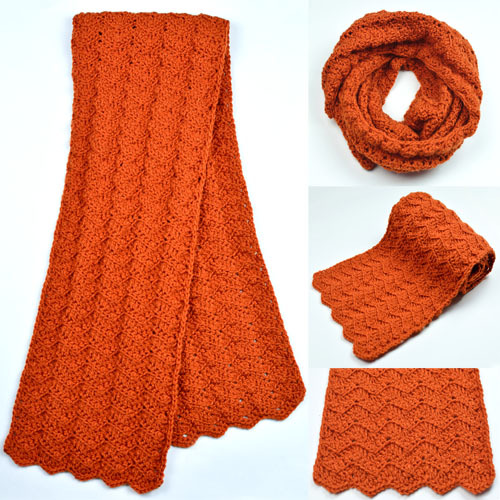 The pattern is easily adjustable so that you can make it as wide and long as you desire. This entry was posted on Monday, December 4th, 2017 at 12:00 AM by Rachel Choi	and is filed under Best Crochet Patterns. You can follow any responses to this entry through the RSS 2.0 feed. You can skip to the end and leave a response. Pinging is currently not allowed.